Cracraft returned 12 punts for 40 yards and three kickoffs for 43 yards in 2018. He was not targeted until Week 17, during which he hauled in a 44-yard pass off of two targets. The Broncos signed Cracraft off their practice squad Friday, Nicki Jhabvala of The Athletic reports. Analysis: Cracraft spent time with the Broncos this offseason, working mostly on special teams. The second-year pro has a shot of making his NFL debut against the Texans this Sunday in a Denver wide receiver corps that recently saw the departure of Demaryius Thomas via trade and that will be missing DaeSean Hamilton (knee) in Week 9. The Broncos signed Cracraft to their practice squad Wednesday, Ryan O'Halloran of The Denver Post reports. Analysis: Cracraft has spent on-and-off time with Denver's practice squad since 2017, but has yet to make his NFL debut. The second-year wideout worked primarily on special teams this offseason, including as a kick returner. Cracraft's clearest path to eventually cracking the 53-man roster is to impress on special teams, especially considering the Broncos' solid wideout depth. Cracraft is listed as a third-team receiver and No. 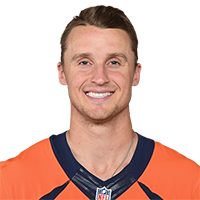 2 punt returner, the Broncos' official site reports.